Should you Keep your Child Animal Free? Home > Animal Free Children > Should you Keep your Child Animal Free? Deciding to try to cut animal products out of your life is reasonably straightforward. Very few people will really be affected apart from you. But should you make the decision to keep your kids animal free? How will making them vegetarian or vegan affect their life? Will there be consequences for their health? Many vegetarians decide to keep their children on a vegetarian diet as well. Perhaps they would prefer not to handle meat and will allow the children to decide for themselves if they would like to eat meat when they’re older. Other vegetarians take the opposite view and are happy for their children to eat meat until they’re old enough to decide if they would prefer a vegetarian diet. As far as health is concerned, there is little to worry about with putting a child on a vegetarian diet, so long as you understand a little about nutrition and what a child’s body needs for proper development. A vegan diet can be more complicated. It is not really recommended to keep a baby on a vegan diet from birth – unless you are breastfeeding. Soya milk formula is not as adequate, from a nutritional point of view, as regular formula derived from cows’ milk. You should consult your doctor or other paediatric specialist before opting for vegan formula for your baby. 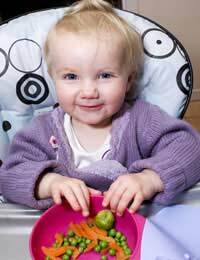 Once the child has reached a year of age, their dietary requirements are a little less specialised and there is some flexibility with their diets. However, it is important to remember that the developing child needs large amounts of certain fats, proteins, minerals and vitamins to allow them to grow and properly build certain aspects of their body like bones, nervous system and brain function. So long as you ensure their diets contain all these things, there should be no reason why they would not thrive on a vegetarian or vegan diet. There are some added benefits to trying to minimise your child’s contact with other products that may contain animal products or have been tested on animals, particularly when it comes to keeping them clean. Very young babies do not require much washing or bathing. Their skin tends to keep naturally clean. You can change their nappies using cotton wool and water, rather than wipes that may contain chemicals tested on animals and wash them in plain water, adding a drip or two of olive oil at the end of the bath to moisturise their skin. It is completely unnecessary to use special bubble baths, washes, oils or soaps. By minimising their contact with strong chemical astringents that will usually have been tested on animals, you are minimising the likelihood of them developing rashes or other sensitivity to cosmetics. It is worth bearing in mind that babies’ skin is much thinner than ours and chemicals are more easily passed through the skin into the body. Some scientists are concerned about an accumulation of chemicals within children’s bodies and we have no real way of knowing the ultimate effects as these build up. Very small children do not have a blood / brain barrier, so chemicals passing through the skin can also go into the brain. Since many cosmetics that are animal friendly also tend to be the greener, more eco friendly ones that contain fewer chemicals and more natural ingredients, by opting for toiletries that have not been tested on animals, you are likely to also be helping your child avoid some of the stronger chemical agents. By taking the decision, as a family, to try to live an animal free lifestyle, you’ll be teaching your child healthy eating habits and keeping them safe from potentially harmful chemicals. There’s a chance you may experience pressure from the family about whether you should keep your child vegetarian, but by understanding nutrition you should be able to satisfy any doubts. Perhaps even better, in the long term, you’ll be teaching your child to value all living creatures and to live an eco friendly life where they will continue to nurture the environment all their lives.